The Drowsy Chaperone is the 2017 Montville Township High School spring musical. 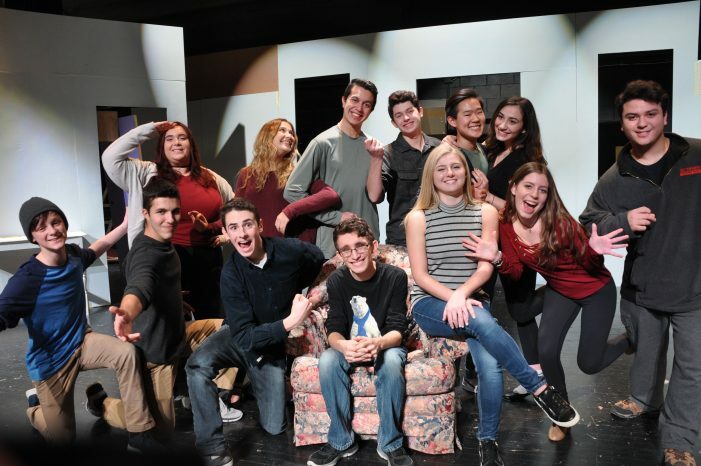 The uproariously funny musical parody is set for Thur., Fri., and Sat., March 2, 3 and 4 at 7:30 p.m. at the Dr. Robert O. Stafford Auditorium at MTHS. A five-time Tony Award-winning musical, The Drowsy Chaperone is fun for the entire family. Like most of the cast, neither of the actresses was familiar with the piece when they auditioned. But the unending laughs of The Drowsy Chaperone have made it one of the cast’s favorite show to have been produced during their time at MTHS. Five seniors hold lead parts in this season’s musical production, including Tommy Sansone who is making his musical theatre debut as the Underling. Sansone, who noted that he played trombone in “the pit for two years,” said that looking up at the action from the orchestra he thought acting looked like fun. “I just wanted to be a part of that,” Sansone said. In addition to Fleisig, Kayne and Sansone, seniors Martin Trogani and Heather Shaw will play lead characters Man in Chair and Janet Van De Graaf, respectively. Tickets can be purchased at the door or will be on sale in advance at MTHS to all members of the public.